We’ve previously shared what to expect during Brazilian Waxing along with Post Wax Care Tips and Must-Have Products. Now we’re focusing on the Brazilian Aftercare Timeline, specifically when to use certain products to get the best aftercare results. For this post, we’re shining the spotlight on Fur Products. Fur is founded by sisters Laura and Emily Schubert, alongside Lillian Tung. The product line offers 100% natural options devoid of artificial fragrances and dyes for minimizing ingrown hairs, irritation, and stubble. Their high quality products have been featured in prominent beauty and fashion magazines like Vogue, Marie Claire, and Elle, and have garnered celebrity fans like actress Emma Watson. During the first 24-28 hours your skin will be sensitive. Use a cold compress to reduce pain and swelling, wear loose clothing, and avoid harsh chemicals. Abstain from sexual activity, exercise, baths, saunas, the beach, and pool. All of these will irritate newly waxed skin, plus heighten the risk for potential infection, too. Hair grows in multiple stages, and everyone's rate of hair growth is different. When waxing, it's possible there's still hair growing in that follicle. The result can be sporadic hair regrowth a couple days later. Depending on your personal hair growth cycle, once you notice stubble starting to grow in, begin using Fur Stubble Cream, which will help prevent and eliminate ingrown hairs and dry skin. The cream features Shea butter and Jojoba oil to hydrate and moisturize along with Tea tree oil to provide anti-inflammatory, anti-bacterial, and anti fungal properties to inhibit ingrown hairs. How to Use: Apply the Fur Stubble Cream in conjunction with Ingrown Concentrate (which targets bumps, redness, and irritation) daily on clean skin. Once you’ve grown out of the stubble phase, keep your hair soft before your next wax with Fur Oil. This nourishing oil features Grape Seed Oil that soothes skin with vitamins A and E, Jojoba Oil to soften hair and skin, Clary Sage Seed Oil to reduce inflammation and regulate production of natural oil in your pores, and Tea Tree Oil, too. How to Use: Apply to clean skin and hair in conjunction with Ingrown Concentration daily. And helpful tip: Fur Oil is great to use right after waxing, too, to hydrate! READY TO GET SMOOTH, HAIR-FREE SKIN? La Belle Studio can custom tailor any individual waxing needs. Give us a call at 302-656-0555, 302-378-8880 to book your Brazilian Wax plus any other body waxing service. Waxing is a great way to have smooth skin that stays hair-free longer than traditional shaving. And overtime your hair will grow back finer, making it less noticeable between treatments. Once you have smooth skin, don’t forget about Brazilian Aftercare! Once your skin is void of any redness, exfoliate the area with a gentle scrub to prevent in-grown hair. A favorite scrub of ours is Deck Scrub! Deck Scrub Original. Features Bamboo Stem and Pumice to remove dead skin that causes ingrown hairs. Canadian Willow Herb eases pain and kills the bacteria that cause red bumps. And Vitamin E and Shea Butter help to moisturize. Deck Scrub Sensitive. Gives you the same results as Deck Scrub Original, but is gentler for sensitive skin. The Sensitive version features Aloe, Chamomile, and Comfrey to soothe the skin. Deck Polish. After hair removal, hydrate and restore your skin with Deck Polish. This product features shea butter and orange peel to hydrate and soothe. Amino acids, comfrey, and natural anti-inflammatories to help heal (and soothe) the skin. And natural astringents close pores to keep your bikini zone smooth and bump-free. 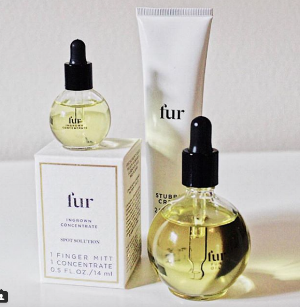 Fur Oil: Softens hair and clears pores. Stubble Cream: Makes regrowth appear soft and fine. Ingrown Concentrate: Targets bumps, redness, and irritation.